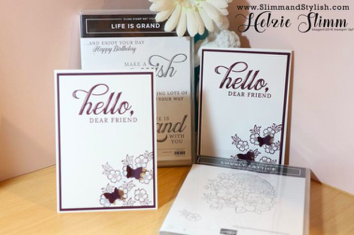 Jill has been doing the #simplestamping and has used different colours to give different looks to these cards. I love the purple one of course but also the blue one. Love this stamp set so much. I love this card that looks really simple but actually has many elements, there is embossing, die cutting, matting and layering. Just beautiful. Helzie has made a lovely clean and simple card. I really like black and white cards and I love the little butterfly punch as well.